I try to be sparing with installing Firefox extensions. It’s easy to get install-crazy and the next time you look, FF isn’t stable and you’re not 100% sure why. But here’s something that I totally want: an extension that converts my currently-open tabs to a list of links. As you can see, there’s a lot of good stuff there, but it would take forever to craft those links by hand. Anybody know of a tiny, robust Firefox extension that does this? Ideally, it would even allow a blacklist of domains not to convert into tabs. For example, I almost always have Gmail and Google Calendar open, but I don’t need those converted into links because typically I don’t want to blog about them. Anyone know of a small extension that does this? It’s true that we need this to be even plugged into wordpress. I will try to find one. By the way, did you join information-revolution.org ? How about a simple, non-extension (not as automated, but not as time-consuming) solution? Bookmark all tabs, then export the bookmarks as a HTML file. Problem is that exports ALL your bookmarks, and they’re not exactly a clean set of links… mmm. Seems like an extension would be a much easier and complete solution, ignore me! Bookmarks > Bookmark all tabs will bookmark all current tabs. Then go in to your profile, bookmarks.html and view > source. Run a little regexp to clean it up, and you have your tabs. Not ideal but it saves typing them out. I’m not big on Firefox extensions either but what I’ve found useful is to use the Google Bookmarks button on Google Toolbar and click on “Bookmark all tabs”. This will store them all in one location that you’ll be able to retrieve at a later time… even put them on your personalized homepage. Hmmm, don’t know of anything that does that. Something a little OT is this ,which allows you to navigate around open tabs easily: https://addons.mozilla.org/firefox/112/ – have found this very useful. You don’t even need an extension to do that. Then go to “Organize your Bookrmarks…”, select the bookmarks in the new folder and copy/paste. 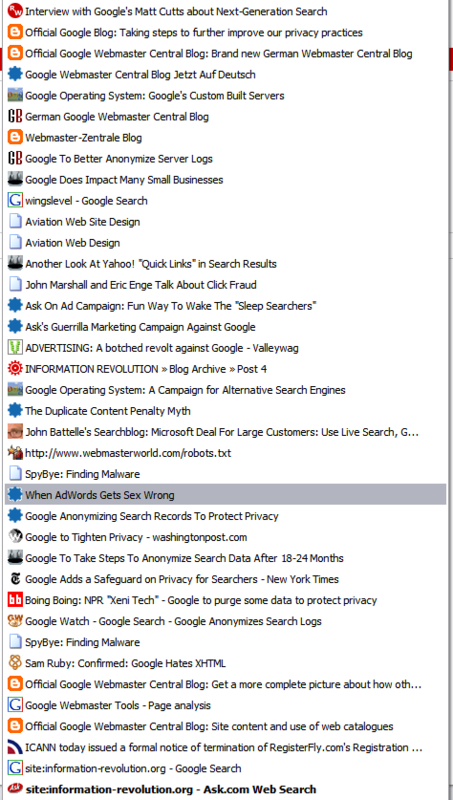 I don’t want to sound too obvious, but why don’t you use the “bookmark all tabs” feature that comes with Firefox? Like Matt Eason I always used Copy all urls to save my open tabs into a txt. I’ve had quite a few requests for new features for Make Link in the last few days. I’ve made a few updates, and I expect to add a few more features soon. I’ll keep this post in mind and see if there’s a logical way to implement it without over-complicating what should be a simple extension for other users. It would be even faster if you bookmark your “bookmarks.html” on the bookmark toolbar. If you right click on the tab in FF you get an option to create a bookmark of all the tabs open. Of course if you are like me, you end up with 100 bookmarks and can’t find the source you wanted with all of them. Sigh. Rory, sounds like there’s no need to complicate your plug-in, but thanks for stopping by! Do you have any place I could donate some moolah for your plug-in? JohnMu, I often do that too (killing FF after a few days to reclaim that memory). In fact, that’s a great way to install extensions while preserving your open tabs. But it’s nice to be able to dump them as well. Works just fine you get nice list. I wonder why I expert from Google engineer to be able to solve that. Once Matt wrote “people expect perfection from Google” you were so true. For most of us you are consciously or unconsciously personal hero and idol. Matt, I’m actually a regular reader here. I was surprised enough to see Make Link mentioned in one of my blog subscriptions earlier in the week; I’m downright flabbergasted that it’s happened a second time! I had thought of putting a Paypal link on the Make Link page on my site, but I have never got around to it. I think I’m happier just giving that little bit back to the Firefox community. I’ve got a lot more out of it than I’ve put in. Matt, thanks for using my extension and for the donation! ThePost, isn’t Maxthon based on IE? You could just right click the RSS folder and click Open In Tabs, and for each tab hit ALT-D to go to the address bar and CTRL-C to copy the URL to the clipboard. Then just paste it wherever. Wouldn’t be terribly time consuming, though that wouldn’t capture the name of the page. Hello, Matt, I see you busy in Firefox tuning. Can you check out my ‘Tags Everywhere’ extension (I put it in URI field)? It shows contextual Del.icio.us tags on webpages, in SERPs, in news2.0 lists. Cast-aside the tired old arguments and give it a blast – Yes, it’s built *on* IE’s engine but that’s not the same as saying it “suffers” IE. It really is awesome (and I speak from the perspective of having “them” all installed, to compare.). Read Glyn Moody’s assessment of [URL=http://www.linuxjournal.com/node/1000159]The Real Firefox-Killer[/URL] over at Linux Journal. … and just wait ’till v2.0 rolls-out: Drag window to split-screen; built-in screen-capture (full-page or regional etc…), couple both those with the Blogdex plug-in (a WYSIWIG blog-writer/poster), and you have an excellent powertool for bloggers (the writer on one side, web-page t’other). Oh, I could go on, trust! 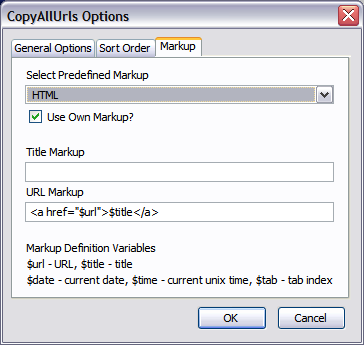 I just installed the “Copy All URLs” extension and it works great. Now I can coyp the URLs of the as many tabs now and even store them in a file. Thanks for sharing. 🙂 BTW, is there a limit as to the no. of tabs that can be copied at a time. 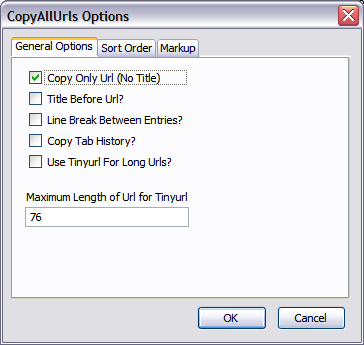 It even has an option to export the tab list as a Linked URL list. Let me know what you think.